Ariel Sharon Israel's former Prime Minster, Defense Minister and general who led Israel to a victory in the Yom Kippur war passed away today at the age of 85. The medical condition of the comatose former Israeli Prime Minister Ariel Sharon sharply deteriorated during the last week. Sharon, 85, had been in a coma since 2006 when a devastating stroke incapacitated him at the height of his political power. Since then, he has been in a vegetative state, connected to a respirator. His family has said that he had sometimes opened his eyes and moved his fingers. Sharon was one of Israel's most iconic and controversial figures. As one of Israel's most famous generals, Sharon was known for bold tactics and an occasional refusal to obey orders. As a politician he became known as "the bulldozer," a man contemptuous of his critics while also capable of getting things done. His connection with the Rebbe began after his son Gur tragically passed away in 1967. A Chossid mentioned to the Rebbe that Sharon was devasted and had asked him how it was possible that G-d could do something like this. The Rebbe reached out to Sharon with a long letter. The Rebbe commended Sharon for being among those who secured victory for the Jewish People against their enemies. The Rebbe also thanked him for donning tefillin at the Western Wall, a publicized event that inspired many Jews worldwide. Sharon was deeply touched by the letter. When he traveled to America, he arranged a meeting with the Rebbe. Naturally, Sharon assumed he would meet a Chassidic rabbi whose only brilliance was in Torah studies. He was therefore astonished when the Rebbe discussed defense issues as authoritatively as an IDF general. Likewise, the Rebbe was familiar with the geography, demography, and politics of Israel. When the Rebbe asked Sharon why eight soldiers had died in the battle for Kalkiliya, Sharon explained that they had to cross a certain wadi where the enemy had been waiting. “But why did you have to go through the wadi?” the Rebbe asked, and then proceeded to draw up an alternative method of capturing Kalkiliya, as if he had consulted a regional military map! Sharon was amazed. Thק Yechidus continued well into the early hours of the morning. 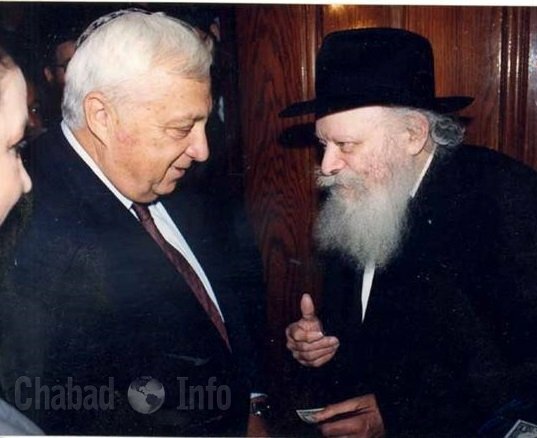 When they parted, Ariel Sharon left with a genuine respect and affection for the Rebbe. On July 23rd 1968, the Rebbe saved Sharon’s life. During a meeting with the Rebbe, Sharon periodically checked his watch, as he was scheduled to return to Israel that night. The Rebbe suggested that Sharon stay a little longer and take another flight. Sharon complied and they finished their conversation. Later that night, the EL-AL flight Sharon had planned to take was hijacked to Algeria by the ‘Popular Front for the Liberation of Palestine.’ All Jewish passengers were held for five weeks before being released unharmed. According to those released, the hijackers seemed to be looking for ‘someone important,’ and they were enraged when they realized that he was not aboard. It was later revealed that the entire incident was an operation executed to capture Ariel Sharon. For six years between 1967 and 1973, Israel built up her military defenses including the Bar Lev Line. Named after Israel’s Chief of Staff, Chaim Bar Lev, the Bar Lev Line was a fixed demarcation between Egypt and Israel along the Suez Canal defended by small military outposts. Sharon was adamantly opposed to the plan because he felt that a more mobile security arrangement was essential. He was discharged from the army because of his confrontations with Bar Lev. A few years later, Sharon left the army and formed the “Likud” party with Menachem Begin. When the Yom Kippur War broke out in 1973, Israel was caught unawares. The Egyptian army destroyed the Bar Lev Line; hundreds of soldiers were trapped in their positions and almost 3,000 died. Sharon, reinstated as Commander of the armored divisions, promptly crossed the Suez Canal and attacked the Egyptian army unexpectedly. This battle assisted Israel’s subsequent victory. After the Yom Kippur War, Ariel Sharon reentered politics, eventually becoming Prime Minister of Israel in 2001. In mid-2005, he directed the infamous expulsion of thousands of Jews from the Gaza Strip. It left thousands of families without proper housing and jobs until this very day. He later bolted the Likud Party and established the centrist Kadima Party. He appeared on his way to an easy re-election when he suffered the stroke in January 2006. His deputy, Ehud Olmert, took over and was elected prime minister a few months later. Sharon had a first, small stroke in December 2005 and was put on blood thinners before experiencing a severe brain hemorrhage on Jan. 4, 2006. After spending months in the Jerusalem hospital where he was initially treated, Sharon was transferred to the long-term care facility at Tel Hashomer hospital. He was taken home briefly at one point but returned to the hospital, where he had been since.